Five-year-old Pelle-Göran, who is ordinarily a very well-behaved little boy, has begun acting out as a result of his mother's recent injury which has kept her confined to a hospital bed. Though his mother is expected to recover, Pelle-Göran's father thinks it will be better for everyone if Pelle-Göran goes away on a holiday to his grandmother's house. While visiting his grandmother, Pelle-Göran gets to know his cousin, Kaja, who is an orphan, as well as a variety of colorful characters who live near the farm. While his mother convalesces back home, Pelle-Göran helps to reunite an estranged grandfather with his grandchildren, discovers whether dogs can talk, and learns to make a spettecake, the gift he has promised to the doctor for curing his mother. This novel, translated from Swedish and set in Sweden, is a charming story of the same variety as The Good Master, wherein a child steps out of his comfort zone and begins to grow up as a result of the experience. Pelle-Göran, though seemingly obnoxious at the start of the book is actually a sympathetic and sweet protagonist. His concern for his mother, as well as his innocence about farm living, make it easy to root for him, and his friendship with cousin Kaja is a strong element of the story. Because Pelle-Göran likes to hear stories, there are also a few Swedish folktales interspersed throughout the novel, which give the book a little extra cultural flavor. Though much of the story feels universal, and could happen on a farm in any country, these folktales help to give the American reader a little insight into Swedish customs. 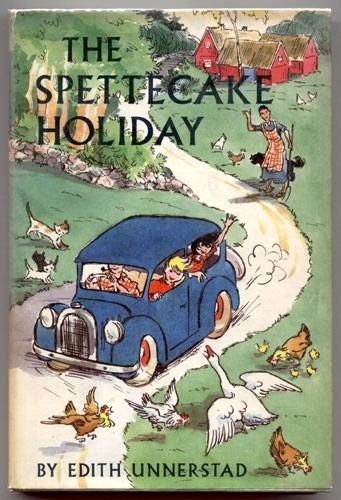 The Spettecake Holiday wasn't exactly the kind of book I had in mind when I first chose family stories as this month's theme for the Old School Kidlit Reading Challenge, but it winds up being a good fit. Not only does Pelle-Göran worry for his mother, but he also grows closer in affection to his grandmother and cousin and witnesses and helps to resolve the difficulties between two of the neighborhood children and their own grandfather. The story itself is largely episodic, and sometimes I found myself wondering if anything was ever going to happen, but what seems to be at its heart is the importance of family and the value of their support in enduring childhood difficulties. Overall, I found it to be an enjoyable and gentle tale, appropriate for reading aloud to kids as young as five or six. In addition to The Good Master, The Spettecake Holiday would also pair well with the 2015 novel, Adventures with Waffles by Maria Parr, which is set in Norway and is also a work of translation.